Those of you who have attended the ILTA, or any other state land title association’s, convention over the past few years and heard the ALTA presentation will recognize the following quote: “It’s not hard to make decisions when you know what your values are.” (Roy Disney (1893-1971) Walt Disney’s elder brother and financier of his efforts.) A simple yet powerful idea for building character in any individual, or company. Strong personal and professional values can insure the long-term success of any individual or company, even when doing the right thing may have a monetary cost. I’ve been told that my involvement and participation in ALTA, and presumably ILTA, has brought little or no value to my company. I, of course, vehemently disagree with that criticism. There is certainly an expense to participation and it is difficult to quantify a monetary return to the company compared to the monetary investment in participation, but how do you measure a monetary return on personal and professional growth? How do you measure a monetary return on professional relationships that are built over a period of years? How do you measure a monetary return on strong personal and professional values that are shaped over time as a result of working with other title professionals within the association? You really can’t. However, I can attest that my involvement and participation within ILTA and ALTA over the past several decades has provided me with tremendous personal and professional growth, which has positively influenced my value system. I have resisted trends or recommendations to cut corners in our work and how we handle transactions, just to make more money in the short term. We work hard to do the right thing. A strong value system in any company must start at the top if it is to permeate the entire company. We have all been clients or customers of businesses that do not have a strong value system in place. They are good examples of what not to do, and they often do not succeed in the long term. I think we have also been clients or customers of companies that do have strong value systems in place. We tend to continue to do business with those companies and they tend to stay in business for much longer periods of time. Those companies or organizations always have an owner/manager/director who sets the positive example and expectation for a good value system within that company or organization. Active involvement and participation in our trade associations does provide a return on the investment, in terms of personal and professional growth, and in terms of building a strong value system. 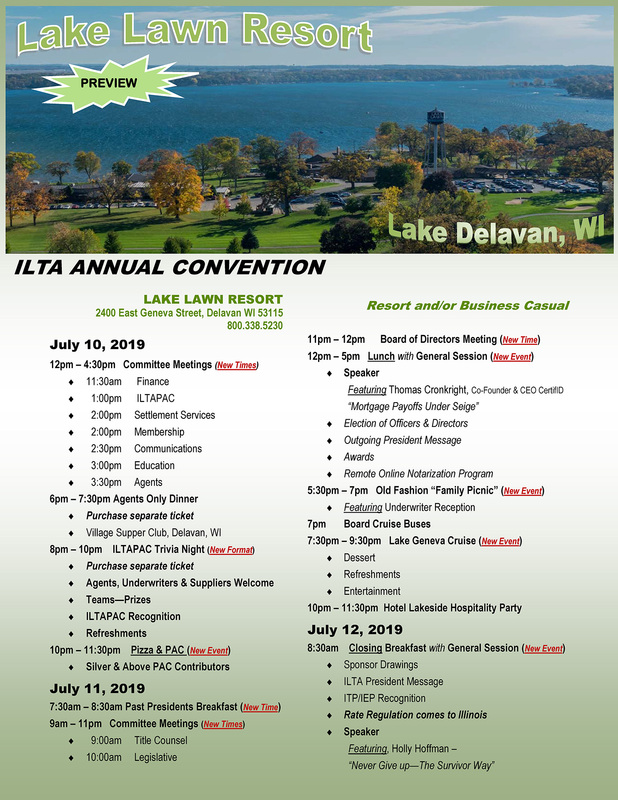 I’ve had the privilege of working with some exceptional people in the title insurance industry over the years, all because of being involved in ILTA and ALTA. I am very comfortable with my value system, which was shaped not only by my upbringing, but by my engagement with other title professionals through involvement in our trade associations. The return on my investment has had tremendous value to me and to my company.